Sara's longtime crush, Luke, has been her best friend for as long as she has been a part of the group. When Luke begins seriously dating another of their friends, Sara's forced to deal with her hurt and jealousy, while outwardly try to support them both. While Sara comes to terms with her own heart and her friends' relationships, an unexpected handsome pilot from North Carolina and an old flame are thrown into the mix. Knowing her heart suddenly becomes much more complicated. I really enjoyed reading The Last Summer. The book is written in first person point of view and we journey with Sara in a coming of age story with romantic elements. It's also a book I'd recommend to writers who are looking to study writing craft in the contemporary fiction genre. The story is written using first person single viewpoint and has compelling conflict, great pacing, tight story structure and a plot that isn't predictable. These story elements all come together to create a smooth, fun and exciting read. Sara has had a secret crush on her best friend, Luke, since the moment they met at the singles group at church when she moved back to Texas. She was welcomed into their tight knit and fun loving group. The seven friends support and encourage each other as they do life together. Their idyllic and comfortable friendship group is challenged by life changes and new relationships. When Luke starts dating Debra, one of her friends in the group, Sara struggles to cope with how the budding romance impacts her friendships with both Luke and Debra. I loved the ensemble cast of characters who were both real and flawed. They made mistakes and had to live with the consequences of their decisions. The faith of each of the characters played an important role in the story and impacted their life choices. I spent a large part of the book uncertain about how I'd like to see the story end. I love Brandy's writing style and I couldn't put the book down. 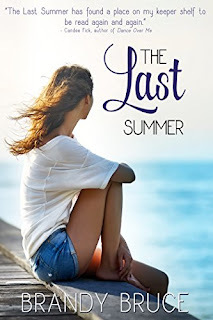 I highly recommend The Last Summer to readers who enjoy contemporary Christian fiction that's reminiscent of the 90's tv show Friends. 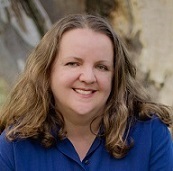 Learn more about Brandy Bruce and her books here. This sounds like my cup of tea! Thanks for the recommendation, Narelle. Iola, you're very welcome :) Enjoy! Narelle, I seriously teared up reading your review. Thank you so much for your thoughtful words, friend. You captured everything I hoped to accomplish with the story.